My son (7) and I (Mom) reviewed this book for Mother Daughter Book Reviews. Here are our thoughts:SON SAYS:This book is about using our imagination. I really liked all of the pictures – they were really funny. My favorite picture is of the fireflies that have a body made out of a light bulb. That was really funny. My favorite part of the story was the lollipop soldiers because they were funny. I also really liked the little stars because they were cute. Nothing made any sense and that was good because it doesn’t make any sense for fish to have hair, bumblebees to swim, and for bananas to be round and glow in the dark. I liked how the book was silly. I learned that if chocolate were purple, bananas would glow in the dark and be round. And, lizards would dance and sing and dolphins would fly. That’s what would happen. Overall, I really liked this book and I thought it was very funny. I want to give this book 100 stars but my Mom won’t let me. I think everybody would like this book.MOM SAYS:If Chocolate Were Purple is a highly imaginative, whimsical journey exploring what would happen if we let our imaginations run wild. “If chocolate were purple” is just the beginning. Think about what the world would be like if dolphins could fly or if bananas were round and glowed in the dark or if the stars hummed a tune as you kiss your loved one goodnight. But the best part of the story comes at the end when a mother’s love comes shining through leaving the reader filled with delight and warmth.I think my son and I agree that If Chocolate Were Purple is a fun and imaginative story featuring superb rhyming, beautiful illustrations, and lots of silliness. The author gets very creative in taking the reader on a journey deep into her imagination where all kinds of strange beings do unexpected things. My kids and I all loved the part about the lollipop soldiers providing comfort to a child who may be afraid of the dark. Most kids, at one time or another, will experience fear at nighttime and I think the idea of lollipop soldiers standing guard is brilliant.The illustrations were all superb in how colorful and detailed they were. There are many details in the pictures that are not mentioned in the text making this book one that children will want to revisit again and again in an attempt to spy something they had not noticed before. My son kept complaining that I was turning the pages too quickly. He was very interested in the illustrations and pointed out many things that I had missed. I also have to comment on the cover – it is absolutely eye-catching. This is a book I would notice right away on a library or bookstore shelf.My Bottom Line: If Chocolate Were Purple is a whimsical journey featuring solid rhyming, beautifully detailed illustrations, a great deal of silliness, and a heartwarming ending that will leave children and their caregivers feeling utterly delighted. I highly recommend this book as bedtime book or in the classroom as a jumping off point to get children to open their minds and let their creativity flow. Ages 3+* This book was provided to me by the author free-of-charge in exchange for our honest reviews. All opinions expressed are our own. This book was so fun and COLORFUL that we had to re-read it immediately. Written by Jen Barton, illustrated by Yoko Matsuoka, it was just plain silly...and that is why we liked it so much. A fun reassuring read before bed. Kids will love it. If Chocolate Were Purple is a fun, insane read and encourages children to allow their imagination to run wild. The title of the book gets you questioning what life would be like outside of what we already know. This fantasy picture book includes happiness, humor, and surprises that you would not expect. The love and connection between the mother and child in this story can be related to a child who is close with their parent. It gives you the chance to feel emotions and create a different sense of normal. Living in a fantasy world for a day would be an awesome experience for any child; by reading this short story gives children that opportunity through imagination. The simple text and colorful images easily keep a child entertained through out the entire story because it is easy to follow along. The illustrations are exaggerated, bold, and fun by bringing out life to an audience. The humor in this story is relevant to what a child's humor is like in early and middle childhood. The theme of the story is unexpected from what the initial relayed message would be considering the title. It is a creative perspective for children to understand that no matter what happens their parent will always be there for them. Author Jen Barton went above and beyond with this story and I would highly recommend it to children. If chocolate Were Purple is a great book for children to expand and explore their imagination. The pictures used in this book were very colorful and fun. The book was filled with rhymes to make it easier for the kids as well. Having chocolate be purple, if bananas could glow, or even if dolphins could fly were parts I found to be funny and cute. What a fun, heart warming, and clever read! I read this book to my seven year old daughter who insisted my partner read it to our other children. They giggled and carried on from the 2 year old up to the nine year old. I loved this fun, silly, and moving book! Worth the read! If you would eat rainbows how would they taste? Fun reading with my kids! This book will be absolutely perfect for when you're just looking for a silly and fun read with your kids. The book really just rhymes and has a lot of what ifs about the world which I think kids will then naturally start coming up with their own which will be really cool. It just has a sweet message and will promote creative thinking in the kids. 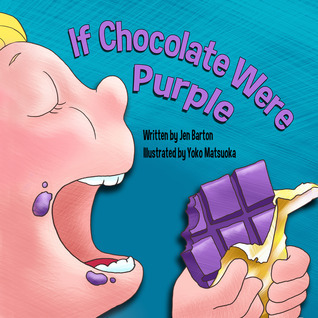 If Chocolate Were Purple by: Jen Barton and Yoko Matsuoka	If Chocolate Were Purple is a heartwarming story about the love between a mother and her child. This book is made for children but can easily be shared as a bed time reading for the whole family. It is a simply yet complex story that will bring joy to all hearts and tears to some eyes. This story could easily fit into the Dr. Seuss genre because it incorporates loving stories into silly and carefree illustrations. The illustrations are fit to make the reader laugh and help bring the story to life. One can easily feel the relationship that Jen Barton has with her daughter; this book was obviously written with a lot of love. Who would not want to live in a world where fish had curly blond hair and chocolate was purple? Author Jen Barton explores a nonsensical world in which chocolate is purple and bananas glow in the dark. Written in lyrical rhyme with fantastically imaginative scenarios, children are transported to a land of endless possibilities. Highly expressive and colorful illustrations are perfectly paired with this book. The most lovely ending to this enchanting read makes a point very clear: one thing is certain - little ones can count on your love. If Chocolate Were Purple is everything a children's picture book should be, all wrapped up in a perfect little bow. If chocolate were purple... what a magical place this world would be. 4.75What a delightful book. Just Lovely. Simple for young readers, but with a deeper meaning for the adults reading it to them or with them. Gorgeous, yet simple rhymes and although outwardly "silly', gives room for adults to encourage their youngsters to think of things in a similar vein.I loved it very much and really enjoyed the drawings too. A great find, a really nice book for littles.